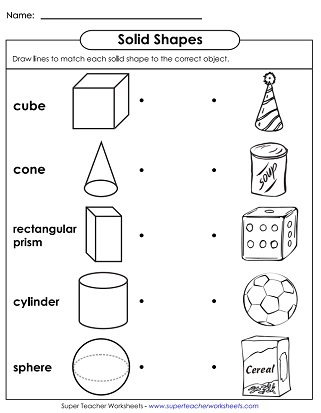 This page has a set of Kindergarten through 1st Grade worksheets on solid shapes. Includes cubes, rectangular prisms, spheres, cylinders, and cones. For more advanced solid shapes worksheets, please see our Geometry: Solid Shapes page. Draw straight lines to match each solid shape illustration to a real-life object that it represents. 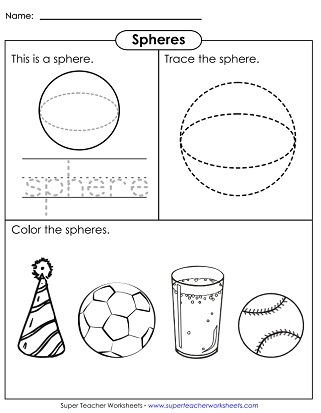 For example, a student would draw a line from a picture of a sphere to a soccer ball. Color the cones red, the spheres blue, and the cylinders green. Trace the word and the picture of the cone. Then color the items that are shaped like cones. After traching the cube and the word cube, decide which items shown are shaped like cubes. Choose from a die, a box of cereal, and a can of soup. Which objects are cylinders? A soup can, baseball, cup of juicee, or birthday hat? Trace the words "rectangular prism" and the dotted shape outline. The color the household objects that are shaped like rectangular prisms. Trace the words and illustration. Then Color the spheres. Choose from a soccer ball, party hat, glass of water, and baseball. Cut out all of the shapes. Place the flat shapes on one side of the t-chart and the solid shapes on the other side. 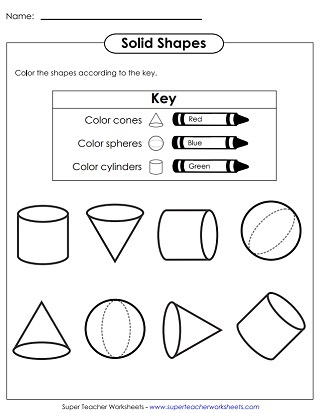 These solid shape worksheets are designed for older students in grades 2 through 6. These worksheets cover rectangles, squares, trapezoids, hexagons, triangles, octagons, and others. This page has an index of printables that are relevant to Pre-Kindergarten and Kindergarten students. Topics include colors, counting, phonics, letters, and more.